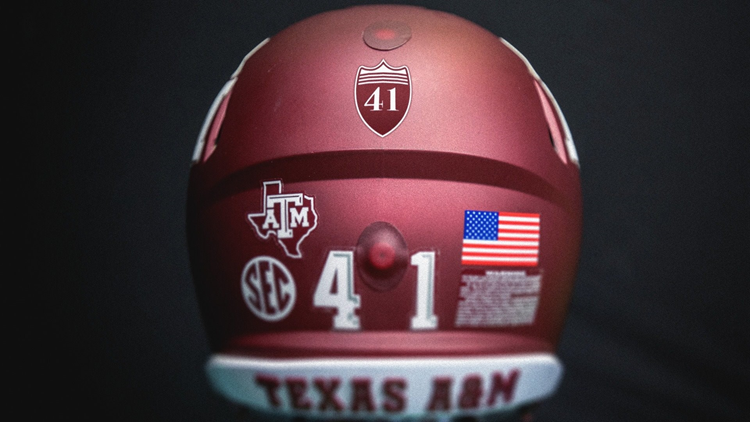 The Texas A&M football team will wear helmet decals featuring a Bush 41 logo. Eventually, all Texas A&M athletic teams will wear tribute helmet decals or uniform patches for the remainder of the 2018-19 school year. When the Texas A&M Aggies face off against the North Carolina State Wolfpack on New Year’s Eve, they’ll do so wearing helmets honoring the late President George H.W. Bush. Bush, an honorary Aggie, died Friday at the age of 94. The Texas A&M football team will wear helmet decals featuring a Bush 41 logo. Similarly, both Aggie basketball teams will wear Bush 41 uniform patches following Thursday’s interment services. Eventually, all Texas A&M athletic teams will wear tribute helmet decals or uniform patches for the remainder of the 2018-19 school year.